Frozen meatballs are a staple at our house. They are so versatile and can be used in so many easy meals! I try to have a stash of these Easy Baked Freezer Meatballs in my freezer at all times, for my own sanity. But the idea of making dozens of meatballs traditionally fried in the skillet just makes me want to give up – I don’t have the time or energy to spend hours standing over a hot stove making large amounts of meatballs. One or two batches, okay. But bulk batches? Not gonna happen. So out of necessity comes today’s recipe for Easy (and Delicious!) Gluten-Free Dairy-Free Baked Freezer Meatballs! I think you will love them as much as we do!! Use a Disher or Cookie Scoop! 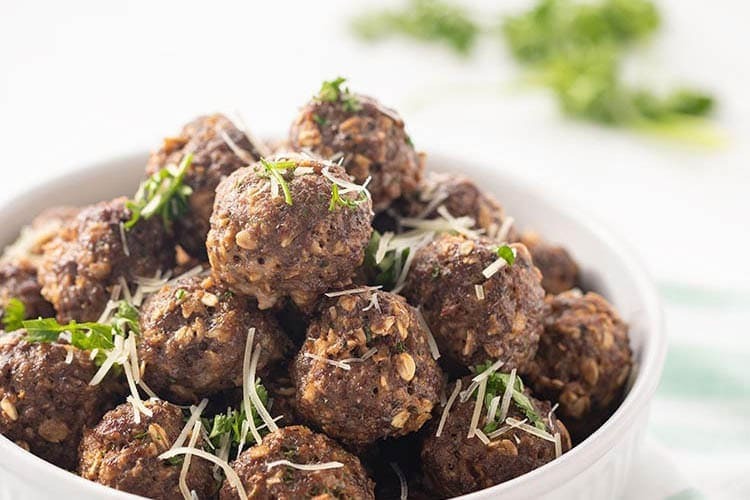 Alright, before we go ANY further, I’m gonna put this one out there – DO NOT even think about making a big bulk batch of these easy baked meatballs without a disher or cookie scoop! Seriously, it will SAVE you time (AND your sanity)! I have found that the 1 1/2 Tablespoon size (sometimes called a 39mm or #40 disher) is perfect for meatballs. They make a meatball that is close to 1.5in in diameter. Not too big, but not tiny either. This size scoop is also the perfect size for cookies or for dishing batter into my mini muffin trays! Double bonus! PLUS, when all your meatballs are pretty much exactly the same size, they all cook evenly and in the same amount of time. No more pulling out a tray with half the meatballs done and half still raw in the center because they are different sizes. Uniformity and even cooking – triple bonus! 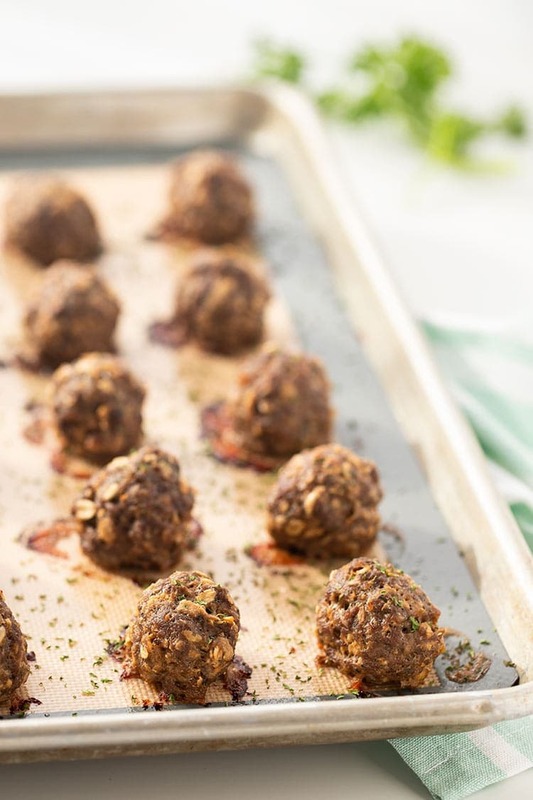 I recommend using half-sheet baking trays, and definitely use parchment paper or silicone baking mats under the meatballs – it makes cleanup SO much easier and helps keep the meatballs from sticking or burning on the tray. You can do it without, and it isn’t a big deal, but cleanup takes a bit longer as you’ll have to scrape off some of the extra bits that have adhered to the pan during baking. Your dishwashers (human or machine) will thank you for using the parchment paper or mats – trust me! Bake in the Oven with a Little Switcheroo! Baking these easy freezer meatballs in the oven allows you to make large batches with minimum effort. I can usually get 48 meatballs on a single tray – that’s a LOT! And two trays in the same oven gets you nearly 100 meatballs all at once! To do two trays at once (if you have two racks in your oven), place both trays of meatballs in the oven (on separate racks), and set your timer for HALF of the normal cooking time. When the time is up, carefully take the top tray out of the oven, rotate it so that what was initially the front of the tray is now the back of the tray, and place it carefully on the inside of your oven door momentarily. Do the same switcheroo with your second bottom tray – take it out, rotate it so what was the front is now the back, and place it on the top rack. Then insert your other tray on the bottom rack. Set your oven for the remaining half of the time and you’re good to go! Once done, I like to let the meatballs cool on the tray for a bit, and then put them into labeled gallon-size freezer bag and stash the bags in the freezer. I haven’t had any problems with the meatballs sticking together, so I don’t bother to flash freeze them first. But you can if you want. You can also skip the baking and freeze these raw (in which case you would want to flash freeze first). But I find it much more handy to have them already cooked so they can come straight out of my freezer and be used in a meal without the extra step of having to cook them first. I’m lazy like that. How many you put in each bag will depend on your family size and your personal preferences. For things like spaghetti, I usually count on 5-6 meatballs per person and then toss in a few extras. That’s usually somewhere right around 36 or so, and that fills the gallon-size freezer bags quite nicely. 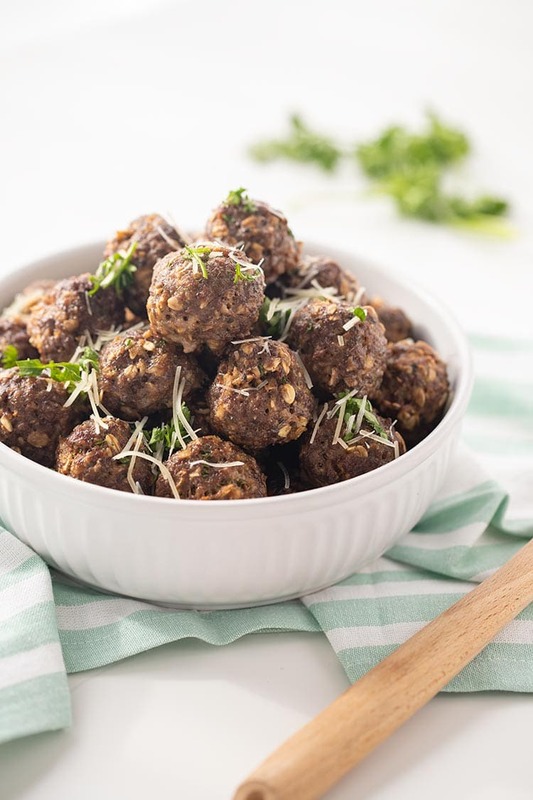 This Easy Baked Freezer Meatballs recipe calls for Worcestershire sauce. Make sure you are using the Lea & Perrins brand, as it is one of the only brands that is actually gluten-free. Most of the other brands make their sauce from barley and malt vinegar which contains gluten. Same with the oats – makes sure you use gluten-free oats. Bob’s Red Mill is a great brand! Lastly, I make these with coconut milk to be dairy-free. But you don’t have to. You can sub regular milk in this recipe 1:1 (use the same amount of regular milk as you would coconut milk). I have not, however, tried this with a sub for the eggs. Not that it wouldn’t work. Just that I haven’t personally tried it with this recipe so I can’t say what the results would be. Now, with that all said, go make yourself some of these amazing Easy Baked Freezer Meatballs! Fill your freezer with all their splendid glory and deliciousness! Your house will smell amazing, and your family will be in awe as you crank out tray after tray of meatball goodness! (Sometimes when I make these only about half make it into the freezer because I can’t keep the other house dwellers from swiping them when they come through the kitchen!) Use them for spaghetti and meatballs, meatball subs, Sweet & Sour Meatballs (coming soon) or my warm, hearty Instant Pot Italian Meatball Soup! Norpro 1.5 Tablespoon Scoop – Mine is older and has the black soft-grip handles. But I couldn’t find the black handled ones on Amazon in the actual size. So these are stainless steel handles – still good. I also have this OXO Good Grips Medium Cookie Scoop (the medium is 1.5 tablespoons) – the Norpros are my favorites, but these OXO scoops are a close second. I have the medium and small sizes. And the most recent addition to my scoop collection, found at Home Goods a few months ago, this KitchenAid Gourmet Stainless Steel Cookie Dough Scoop (1.5 tablespoons) – I have been pleased with it so far. Baking in the oven makes these meatballs quick and easy, especially when doing them in large batches! They hold up great in the freezer and can then be pulled out and used in many different meals for fast easy weeknight dinners! Combine all ingredients in a large mixing bowl. Mix thoroughly (best to use your hands). Portion out meatballs using a 1.5 tablespoon (#40) disher or cookie scoop. Place ball into palm of hand and use the other palm to roll it into a ball. Set meatballs on baking sheet leaving enough space so they do not touch each other. Allow meatballs to cool after removing from oven. Place into a labeled and dated gallon-size ziptop freezer bag and place into freezer. Use as you would store-bought frozen meatballs, or thaw if needed for your particular meal recipe. 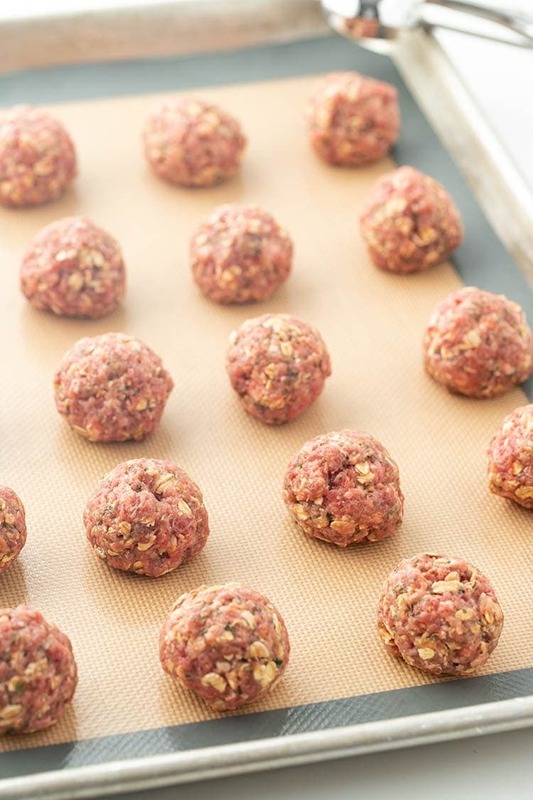 I prefer to bake the meatballs first and then freeze them, but you can also shape them and flash freeze them on a baking sheet and store them in your freezer unbaked, to then bake later. I just prefer the ease of having them already cooked and ready to go at a moment's notice!